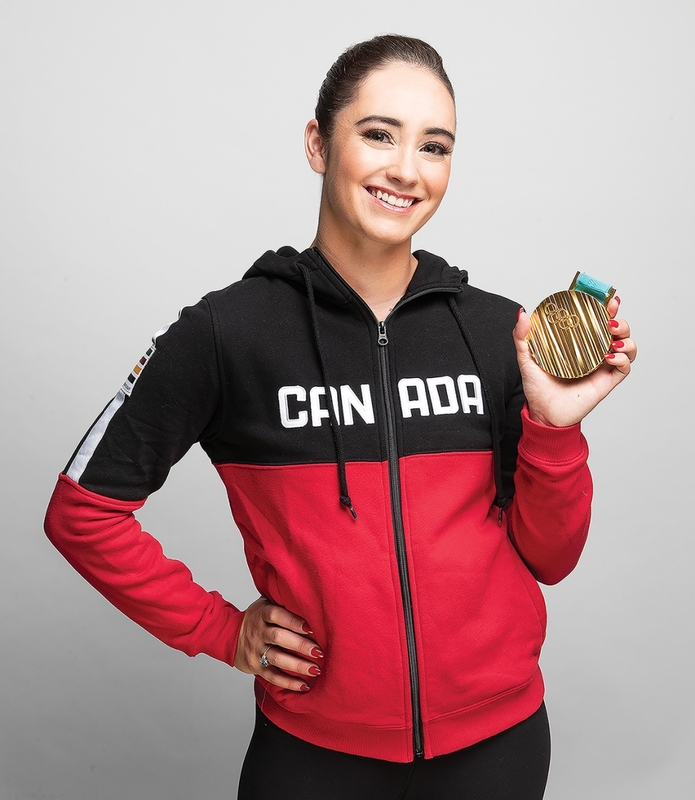 World Champion figure skater Kaetlyn Osmond still leads a rather anonymous existence in Edmonton, despite her massive athletic achievements. There are a dozen figure skaters on the ice. Some spin, some leap, some twirl. Adele’s theme song from the James Bond film, Skyfall, fills the rink at the Terwillegar Recreation Centre. In the third hour of her daily workout, one skater simply does lap after lap. Her pace is steady. The black “Canada” wordmark on her grey athletic top is the only sign that this skater is not like the others. That she’s an Olympic medalist. That she’s a World Champion. After she’s done on the ice, Kaetlyn Osmond sits next to me on a bench just outside of the rink. We’re in a hallway of a public rec centre, but no one stops to say hello. No one comes by to ask for a selfie. Compare that to how Osmond is treated when she goes abroad. After winning the 2018 World Championship in Milan, she travelled to Japan and South Korea to perform in Stars on Ice. There were more than a few selfie sticks and autograph requests. She was a superstar. Game show? What? With the help of a translator, Osmond and some other skaters from the Stars on Ice tour were put in front of the camera. If you’ve seen Japanese game shows, you know that the participants are often put through bizarre physical tasks that are meant to entertain and embarrass. Maybe you’re asked to jump through a wall of Jell-O. Maybe you’re asked to zipline across a mudfield. Don’t fall! Osmond was asked to take part in something called “human curling” and was asked to speed skate against the hosts. Cassels Brock, the legal firm which has backed her for more than a decade, and Nulo Pet Food, which she booked before she went to Olympics. Compare her Edmonton anonymity to what Marystown, Nfld. has done. Marystown is the place where she spent the first decade of her life, before moving to Montreal with her family and, eventually, to Edmonton. Earlier this year, Marystown renamed the local arena after Osmond. So, when it comes to the place she calls home, is it Edmonton or Marystown? It was in Edmonton where she began working with coach Ravi Walia, a former men’s singles skater who won bronze at the 1995 edition of Skate Canada. Her parents, Jackie and Jeff, came west because of work in the oil industry. Her father had also worked in the Middle East before coming to Alberta. Without the move, would she have met Walia? Would she have been put on the path to Olympic stardom and a World Championship? She certainly wasn’t klutzy at the 2018 World Championships. Coming off Olympic gold in the team event, and then bronze in women’s singles, Osmond came into the long program at World Championships in Milan positioned in fourth. She knew that she needed to put together a great skate just to get onto the podium. Winning the gold was surely a bridge too far. Osmond brought out the “Black Swan” routine that she also skated in Pyeongchang. She was dressed in black, her eyeshadow on thick like she was either about to go out for Halloween or head to a Siouxsie and the Banshees show. She had wanted to skate to Tchaikovsky’s famous piece for years, but it took her a while to convince her team that, yes, this was indeed a winning marriage of sport and art. “The artistic side comes with what I feel I can risk, when it comes to things that I don’t know, things that I’m willing to try and I’m excited to try,” says Osmond. “And it’s a group decision between myself, my coach and my choreographer and ultimately how it looks on the ice… When I get to the ice and they call my name I have a moment where I think, ‘wow, it’s cool that there are so many people here.’ But then my music starts and it all vanishes. I am now doing my thing.” She didn’t fall. She nailed her jumps. She leapt higher than the other skaters. On Eurosport, the broadcast crew had this to say about Osmond: “She is a glorious sight to watch on the ice when she is in full flow. She has great speed, precision but also this lovely softness.” The CBC crew was far more reserved; they warned that there were still five skaters left. But Russian Maria Sotskova (eighth), Canadian Gabrielle Daleman Can (seventh), Japan’s Satoko Miyahara (third), Russian Alina Zagitova (fifth) and Italian Carolina Kostner (fourth) couldn’t match Osmond. Then, she was interrupted again. Because the organizers knew Osmond was going to be on the podium, she was told that she had to track down her skates, which she had taken off. She had to be ready to skate out one more time to get her medal. By the time Osmond retrieved them, Kostner was already well into her program. In November, she skated with the Thank You Canada tour, along with Patrick Chan and ice dancing legends Scott Moir and Tessa Virtue. She isn’t going to do the Grand Prix season. She isn’t sure if she’ll defend her title at the Worlds. What’s next for Osmond? Maybe there’s another game of human curling in her future.